Play for free Hold’em Poker online with your friends. Decorate your Vegas style city. Build Casinos, Night clubs, Bars and other infrastructure. Select, Move, Change your Poker City appearance. Buy or Sell your buildings using chips. Grab your free chips from City locations and use them by Playing online Poker. Join Clubs or create private closed Poker Club to play with your friends. Online Chat with club members available. Enter to explore your friends’ Poker City. Five or Nine table seats available. Learn live statistics of your opponent during the Poker game play. Optimal table game speed selection for normal or fast professional poker players. Complete Daily Tournaments and Competitions to win amazing Jackpots. 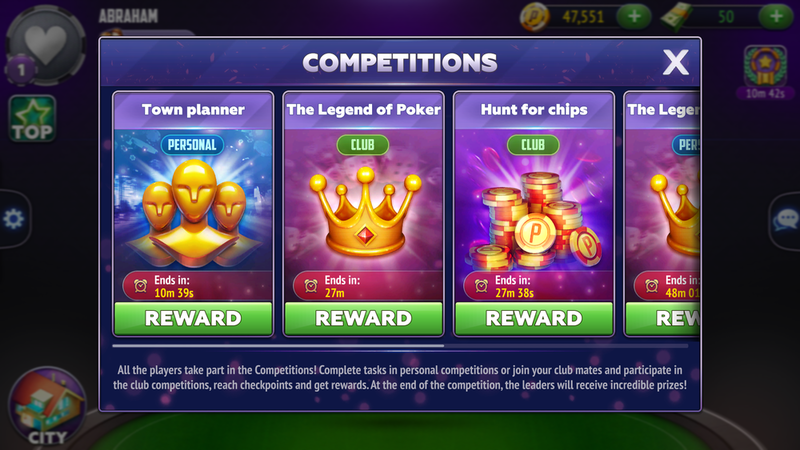 Huge free chips starter package available - 50,000 CHIPS FREE. Royal flush: Straight flush Tens to Ace. Four of kind: Four cards of the same rank and one card of another. Three of kind: Three cards of the same rank. Two pairs: Two cards of the same rank, two cards of another rank. High card: Highest rank from available cards. Poker city created for both, casino fans and Poker players alike! If you play roulette, slots, or blackjack, you’ll feel right at home in our friendly Poker club community! 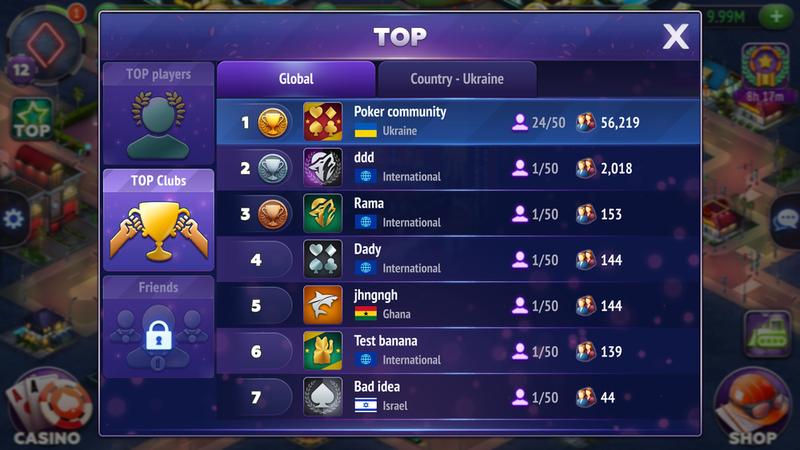 Win the most number of chips and get highest experience points to come out on top in poker leader board community! Casino Style Poker City game will take you into amazing relaxing gaming journey via amazing graphics and relaxing music. 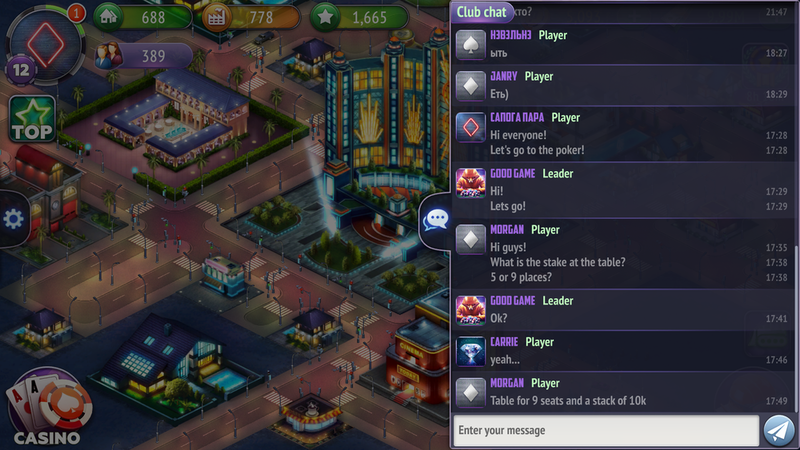 Poker City: Builder is free to Play game for poker casino fans and does not offer real money gambling or other opportunities to win real money or real prizes. The game is free to play; however, in-app purchases are available for additional content and in-game currency. In-app purchases range from $0.99 to $99.99 USD.